Pavol Demitra (November 29, 1974 – September 7, 2011) was a Slovak professional ice hockey player. 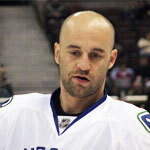 Pavol Demitra joined the NHL in 1993, with the Ottawa Senators, with whom he was originally drafted (227th overall). Pavol Demtira scored on St. Louis Blues goaltender Curtis Joseph for his first ever NHL goal. On November 27, 1996, the Senators parted ways with Demitra, as Ottawa traded him to the St. Louis Blues. Pavol Demitra made the NHL full-time in 1997-98, as he played in 61 games with St. Louis.Demitra appeared in the 1999, 2000 and 2002 NHL All-Star Game. Demitra also scored his first career hat trick, scoring three goals on February 12, 2000. After the season, he was awarded the Lady Byng Memorial Trophy after he accumulated only eight penalty minutes throughout the season. On July 10, 2008, Demitra signed a two-year, $8 million contract with the Vancouver Canucks. Pavol Demitra died in a plane crash on September 7, 2011, along with his teammates from KHL's Lokomotiv Yaroslavl. Pavol Demitra was fifth on St. Louis Blues' all-time scoring list.